In the final part of MediaTel’s series looking in detail at the latest UK adspend forecasts, Suzy Young, data and journals director at Warc, exmaines how new digital technology is accelerating growth for the out of home sector. In Q1 2014, out of home advertising expenditure dipped 2.2% compared with the same period a year ago, according to the latest data released in the Advertising Association/Warc Expenditure Report this week. But this is expected to be just a temporary blip, and Warc forecast consistent growth throughout the rest of the year and into 2015. Warc predict annual growth in the out of home sector of 2.7% in 2014, reaching a total of £1,017m. This is the first time the sector will have surpassed the £1bn mark. The pace of annual growth is expected to accelerate to 5.9% in 2015, or £1,077m. In recent years the out of home sector has performed consistently well, recording year-on-year growth in all but four of the last 31 years, with these dips occurring in line with the total ad market, following economic recessions and the dotcom crash in 2001. Note: Outdoor Media Centre; AA/Warc. Source: AA/Warc Expenditure Report. The London Olympics in 2012 provided a significant boost to out of home ads in particular, with spend rising 25.4% year-on-year in Q3 2012 and helping the annual total increase by a strong 9.5%. According to YouGov research, 62% of visitors to the Games were aware of outdoor advertising related to the event. Consequently, the AA/Warc had initially forecast a drop in adspend for 2013 given the lack of a similar event, but out of home maintained its upward trajectory to register growth of 2.0%. One of the key reasons for this success is the sector’s rapid adoption of new digital technology. As the chart shows, digital’s share of total out of home advertising expenditure has grown significantly over the last 11 years – when the traditional vs. digital formats were first tracked. Digital adspend has grown from a 1.4% share of adspend in 2003 to a 21.6% share in 2013. Mike Baker, CEO at the Outdoor Media Centre, said: “In 2013, outdoor beat expectations, growing 2% over the spectacular Olympic year. What’s behind the continued growth? Digital is the main driver, with consistent investment by media owners into high profile sites such as Clear Channel’s Storm panels on Cromwell Road and Outdoor Plus’ Vauxhall Cross. 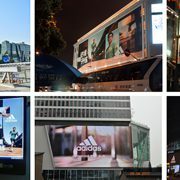 “Importantly, the footprint of digital has expanded geographically, including JCDecaux’s Trinity Leeds, Mediaco’s Citylive sites in Manchester, as well as new sites in Newcastle (Ocean), Birmingham (Signature) and Glasgow (Forrest) and Cardiff (blowUP). According to the Route research carried out by the Outdoor Media Centre (and also published in topline form as part of the Expenditure Report), roadside panels accounted for 28.4% of all out of home panels monitored in March this year (372,818 panels). The next biggest formats were tube carriage interiors at 24.4% and bus panels at 18.1%, as detailed in the chart below. Source: Route, Outdoor Media Centre; AA/Warc. The Real World July 2014 Would You Dive into Freezing Water for a Free Samsung Galaxy S5?